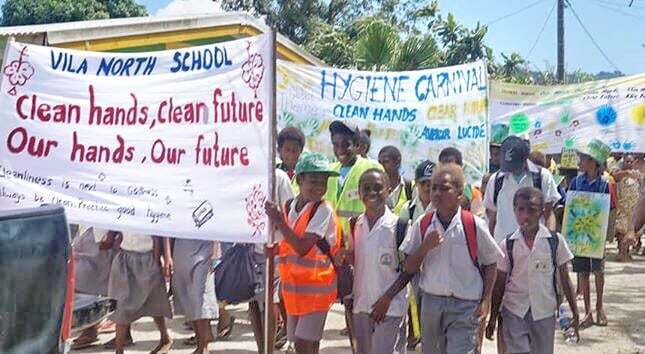 During the in-service program to launch the Arts for Advocacy guides in Vanuatu student WASH Clubs from five schools decided to host a joint Hygiene Carnival Parade to promote Global Hand-washing Day and World Toilet Day. The WASH Clubs in each school found many creative ways to share their message, using the Arts for Advocacy tools. The students made costumes to represent different types of germs that can cause disease if we don’t wash our hands with soap after going to the toilet or before preparing food. Other students carried placards with hygiene messages about the importance of having access to safe, clean toilets. Over 500 students from Suango, Melemaat, Sorovanga, Vila North and Anamburu schools marched through town sharing creative banners, costumes and chanting slogans to promote the theme of “Clean Hands, Our Future.” The community and private sector was also involved in the event, with Colgate Palmolive sending its hygiene octopus character to march in the parade. Also, the National Health Promoting School Committee representatives marched with the children. The schools plan to conduct the Hygiene Carnival again in 2018.